The wind ordinance and changes to the General Plan would streamline approvals for small wind turbines while a lso making it easier for developers to win approval for large industrial-scale wind turbine projects near Boulevard. The proposal encourages developments north of I-8 though allowing options for waivers to place turbines near homes south of I-8, impacting communities such as Campo, Boulevard, and multiple tribal lands. As for health concerns raised by the public including residents suffering health impacts that they attribute to stray voltage and infrasound from existing turbines, a staffer stated, “We were unable to find evidence to support public health issues raised.” Staff acknowledged tthat there is anecdotal evidence of some health issues but drew a distinction between health impacts and “annoyance” and claimed setbacks of one to one and a half miles should be adequate to address health concerns. Staff indicated that the only way to address infrasound is through setbacks, which are recommended at one to one and a half miles from large turbines, since infrasound travels through walls and cannot be stopped by barriers. Robert Fox, testifying in support, stated, “People should have the right to decide for themselves what they want to do. He also revealed that he wants to see a pilot wind project near Julian on Federal Bureau of Land Management property (photo, right). “What we seek is a level playing field” Debenham stated. He wants to see a third regulatory tier created for mid-sized turbines. The Opposing presentation began with Donna Tisdale, chair of the Boulevard Planning group and representative of Protect Our Communities Foundation and Backcountry Against Dumps. The letter from attorney Stephan Volker sent to Supervisors the night before the hearing represented Tisdale and the two nonprofit groups. Tisdale (photo, left) testified in a quavering voice that she is “deeply saddened” by the actions taking place in her community. She stated that her planning group had voted ‘yes’ to small turbines as well as the C-weighted noise scale, while unanimously opposing the noise waiver and changes to Boulevard’s community plan. They strongly oppose large turbines in their area. “We spent over 14 years on our community plan and now you’re going to gut it,” she said. Noting that the Boulevard area has 8,000 acres proposed for large wind projects with 500-foot-tall turbines and 15,000 acres proposed for large-scale solar, she questioned why the county wants to classify such uses as non-industrial. Tisdale also brought up several adverse health impacts she felt were not recognized by the staff. “The Public Health Study is wrong,” She mentioned the ground current’s potential to increase if Iberdrola’s Tule Wind project goes in. She cited measurements taken at homes near turbines by an expert who found that homes near existing turbines in Campo “are described as virtual microwave ovens.” She argued that lack of sleep, a problem staff dismisses as “annoyance” can cause health problems according to the National Academy of Sciences. Moreover, homes two miles from existing turbines have documented infrasound. She warned the Supervisors of the impending effects the projects would have on the wildlife, mentioning eagles that had been struck by the blades of the turbines, a cougar frightened by Powerlink construction into running onto a roadway and being killed and the potential the Turbines had to destroy the wetlands due to their water usage. Turbines could use massive amounts of water and an expert consulted has recommended that developers be required to import all water. Manzanita tribal member David Elliott was the final speaker n the organized opposition presentation. He listed many health problems ranging from a heart attack to join pain that he believes are caused by living near the Kumeyaay wind turbines in Campo. The hearing moved on to individual testimony. George Coladonato was in support, wanting to treat both wind and solar power equally, and then let the market determine which will be used. A business from the Nakao company spoke in support and showed photos of vertical axis turbines from Japan, many small in scale that can be installed on rooftops and even school playgrounds. Jim Whelan with East County Renewables Council called the issue complex but urged support. Two representatives from Iberdrola also spoke; one noted that the company has “begun making construction decisions” based on prior approval of Tule Wind and asked support of the ordinance, as well as an exemption from the pure tone requirements. John Gibson with the Hamann Companies, which has a vested interest in proposed industrial-scale projects in the Boulevard area, also spoke in support. The opposing individual speakers all brought up the previously denied health concerns. Manznita Tribal member Rowena Elliott (photo, left) stated, “We have an epidemic.” She mentio ned several cases of cancer that have appeared in residents who live near the turbines, including a child, only a year and a half old, who has undergone surgery to remove large growths in his abdomen. Elliott also requested the board conduct their own studies, without relying on the Wind Industries. She even referenced the Cape Cod Wind Farm, mentioning that because of the issues it cause the residents, they have begun dismantling the Turbines. Edi Harmon, an Ocotillo resident, described blowing dust and sand that has caused a public health issue due to a wind project constructed there. She also said property values have declined “because turbines are so deleterious” and said the main supporter in town has now asked for his property tax value to be reduced because of blighted views. She noted that around the world, people have abandoned homes near turbines. Harmon said she was troubled to have our region declared a “national energy sacrifice zone” to benefit out of town corporations and absentee landowners over residents. Backcountry resident Bob Maupin he has confronted armed smugglers and “I stopped a drug cartel. These people I do not fear,” he told Supervisors. “It’s you I fear, who will run me out of my property.” His wife has cancer that he suggested may be linked to power lines on the property; he does not want more electrical transmission lines that would be installed along with big wnd projects. Laurie Baker of Santee spoke about hiking in McCain Valley and voiced concerns over destruction of public lands and eagles. Another area resident also opposed loss of public lands including the gateway to the Sawtooth wilderness. Van Collingsworth, an environmental leader from East County, is a natural resource geologist and former wildland firefighter. Greg Lansing, who owns property in Boulevard south of I-8 that he wants to develop into the Jewel Wind project, belittled neighbors who oppose his plans. He stated that “one of the largest European utility companies has pulled out” and said other wind companies are reluctant to come in now. Dan Silver with the Endangered Habitats League said turbines have a negative impact on wildlife and asked that small turbines be limited to no more than two through ministerial permits. 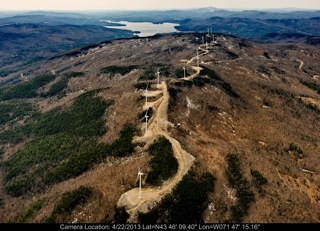 He thanked staff for requiring that small turbines not be located on ridges or near streams. Wendy Shannon has property abutting Rough Acres Ranch, proposed for large-scale wind and solar. “I will believe in wind when I see it on beaches and cliffs at the coast,” she said, insisting that Supervisors “do not have the right” to approve such projects in the backcountry. Melody Ponchot of Boulevard stated that the Shockey Fire “came to my ranch first.” She said 3,000 acres burned in 45 minutes last summer. She previously moved to escape turbines near her home, which she attributed to health problems. If the ordinance is approved, she could have hundreds of turbines close to her new residence. “It horrifies me to think of lightning hitting one,” she said. “If those three airplanes couldn’t put out a fire from a bullet [that caused the Shockey Fire], what’s gonna happen when lightning hits a turbine full of flammable oil?” She noted that a lost hunter’s flare ignited the deadly 2003 Cedar Fire. Putting turbines in her area “would be insane,” she co ncluded. Parke Ewing of Ocotillo lives in the middle of a wind farm half a mile from turbines. Noise at his home “sounds like jet engines on a windy day…the sound is torture,” unlike the “quiet as a dishwasher” promise made by the developer. He also objects to red lights flashing all night and destruction of desert views. Jim Pelley, an aerospace engineer from Ocotillo, called living amid wind turbines on three sides of his home “a living hell…It feels like my home has been taken away from me.” He said he has trouble sleeping and headaches. His dog barks at the turbines and no longer wants to go outside, he said. “Now my dog runs in the back bedroom and lies down, shaking. I believe this is from low-frequency noise.” He said he is also “sickened” by destruction of Native American cultural resources and dangers to raptors and bighorn sheep. Pelley revealed that the data just out from the Federal Energy Regulatory Commission reveals that the Ocotillo wind project is producing power far below what the developer projected, producing only 19% of capacity. “SDG&E ratepayers will see an increase in rates in the near future,” he predicted. He also voiced concerns over “one size fits all foundations” used for turbines over the Elsinore fault line in an active seismic area. After public testimony, Supervisors had no discussion of residents’ concerns or the merits/lack thereof of the proposal. Their discussion focused almost entirely around the legal document and whether a vote should be postponed until staff could analyze it. Sueprvisor Jacob, who represents East County (photo, left), said she likes the small turbine provision but finds large wind turbines “very troubling.” She asked for a delay in the vote to allow staff more time to review the legal questions raised. Deputy Counsel advised that staff can review by the next meeting, May 15, but not if there is new information beyond staff’s technical ability to respond. None-the-less the board voted tod continue the vote until Wednesday. Chairman Greg Cox asked if public testimony would have to be allowed again. Counsel said only if counsel determines there is new information. It was unclear just how the public could be expected to prepare testimony without knowing in advance what, if anything, counsel would deem “new information” if counsel does not report on that until the day of the hearing. Several Supervisors voiced clear annoyance over the last-minute legal challenge. The letter from attorney Volker alleged that approval of the wind ordinance and changes to Boulevard’s plan would not fully mitigate impacts to the extend feasible. He further alleged that staff failed to fully analyze impacts of low-frequency and infrasound, electric and magnetic fields, shadow flicker water use, as well as impacts to birds and bats. He also contends that the impacts of proposed projects on global warming have not been assessed. “The County’s assumptions and goals are unwarranted and the project is not needed,” Volker concluded. The document went on to detail how the County could meet its power needs through rooftop and parking lot solar instead. “Is it legal for us to say we will accept no documents 72 hours before a hearing?” Supervisor Bill Horn asked (photo, right). Counsel advised that CEQA, the California Environmental Quality Act, requires the County to respond even if material comes in at the hearing itself. Horn made a motion to exempt Tule Wind from the pure tone requirements and any new requirements in the future. Cox ruled him out of order. Supervisor Ron Roberts (photo, left) said he is “sympathetic” to Horn’s view and that if it wasn’t for state law, he would throw out the legal documents sent by the lawyer on behalf of residents. Government in California is paralyzed, bogged down by environmental regulations,” he maintained. Supervisor Jacob asked staff to look into how Governor Brown’s latest plan on how to meet a 33% renewable energy goal would impact the San Diego region. She thanked all who came to testify on both sides. The wind ordinance and related matters will be heard next Wednesday, May 15 at 9 .a.m. and will be the first item on the agenda.